Summer is going by way too fast here. Especially since school starts back August 12th. Insane, I know! Back in my day (said in old woman voice shaking her fist), school didn’t start back until the day after Labor Day. I know many schools in the North and West of the US still don’t start back until then. Alas, we Southerners start back early to mid-August. Sigh. That’s okay, Otter Pops will keep us cool, refreshed, and feeling like summer, because YOLO! Otter Pops wants you to have a YOLO moment. Several of them, even. My son has been learning to swim this summer and one of his YOLO moments was diving (okay, it’s more like jumping, but still a big deal for him) off the diving board at the pool. He was scared but wanted to do it more than anything. I’ve not seen him so excited about something in awhile. He was so proud of himself. It is up there as one of my #YOLO moments, as well. 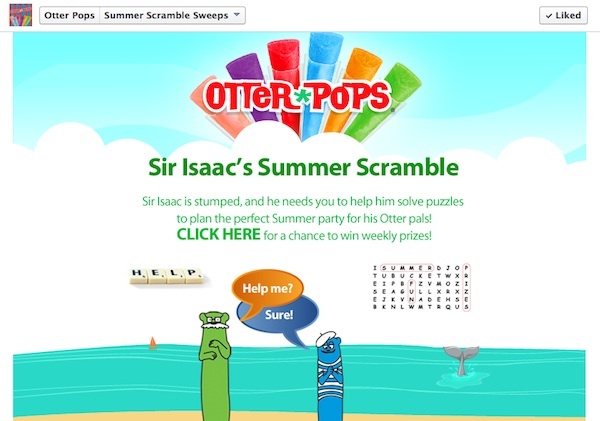 I wish I had taken Otter Pops to the pool with me that day to share with his friends. That would have been a nice reward. As a mom, I like them because they’re a fat free treat. We love grape and cherry the best. So yummy! I have some great news! Otter Pops wants YOU to have your own YOLO moment this summer. They have an awesome giveaway going on to do just that! 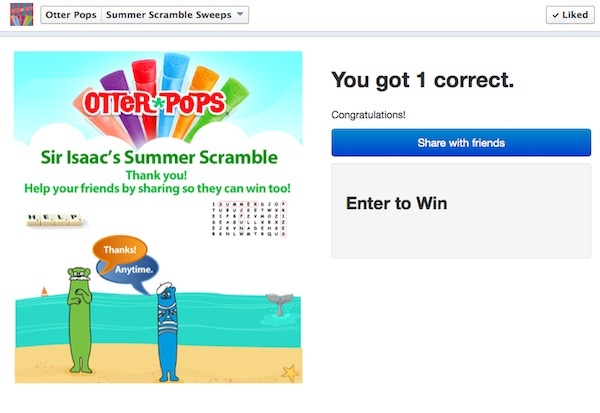 Just enter the Summer Scramble Sweeps “like” Otter Pops, click on the ‘Summer Scramble Sweeps’ tab, and answer the questions to win. Easy peasy! 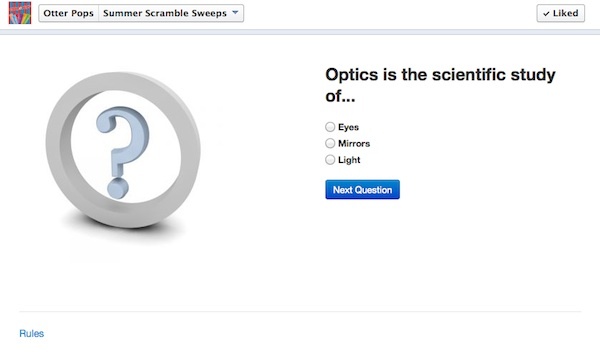 The sweepstake ends August 19, 2013, so be sure to enter. 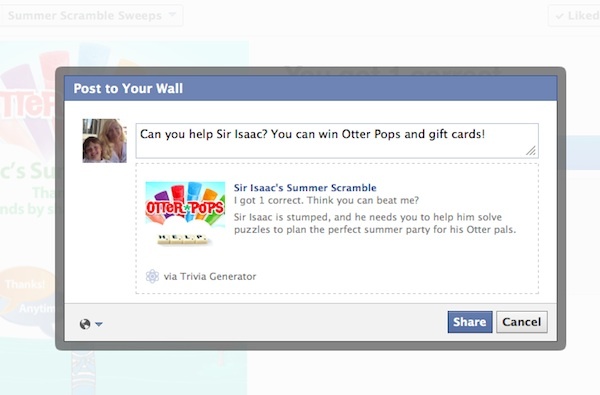 Be sure to like Otter Pops of Facebook and follow @Otterpops on Twitter. My son cannot get enough of otter pops! I remember eating Otter Pops every summer as a kid. Love them! Man I remember these from when I was a kid. I’ve never had them but I’m sure my favorite flavor would be RED! I think it took me a full minute to figure out what YOLO meant, lol. I can’t BELIEVE summer is over — I only have a little bit of time to find some Otter Pops! The kiddos at my house love Otter Pops. My kids love Otter Pops! I grew up eating so many Otter Pops, I should own stock in the company. It’s really cool seeing my kids enjoy them now. I have Otter Pops in my freezer right now. The whole family loves them! I am sad that summer is almost over too. Those prizes are pretty darn great, but I can’t get over the August 12th date. It’s blowing my mind. I need to escape in an Otter Pop right now. Otter Pops are a great treat! Thanks for sharing about the giveaway. We love Otter Pops, and this just reminded me that I haven’t bought any this year…taking them to the pool is a great idea! Who doesn’t love otter pops!! Otter Pops are getting us through this heat! I remember eating Otter Pops are a kid, they were a summer staple growing up. I don’t think I’ve ever tried this brand, but we grew up on ice pops in summer, we always called them Freezies! I don’t think we have really stepped out of our box this year in re: YOLO. Perhaps later on. I haven’t had Otter Pops in years, but when I was a kid we always had them in our house during the summer. They’re a great way to cool off. My kids (and I) love Otterpops…there is just something about them that screams summer. We don’t start school until the 26th. Can’t believe your children went back so early.